New LG Tracfone models have been introduced as part of an effort to have a more stylish lineup. As more and more people realize the drain that a standard cell phone contract puts on their budget, they have started to look at prepaid cell phones as a viable alternative. Tracfone has tried to woo these new customers (perhaps you’re one) by updating their phones and offering models with a little more style. Four LG smartphones are now available: the Ultimate 2, the Optimus Fuel, the Optimus Dynamic II and the original Dynamic. These are among the Android handsets that have been introduced to the Tracfone lineup. The original Dynamic was designed as a compact smartphone while its successors are generally bigger and more powerful. Tracfone still offers feature phones from LG capable of running Java applications. Some have touch screen interfaces and/or QWERTY keyboards. A few models also feature WiFi access. The 306G and 305C look similar in appearance to the 800g below, but have WiFi like the more sharply rectangular 840g. 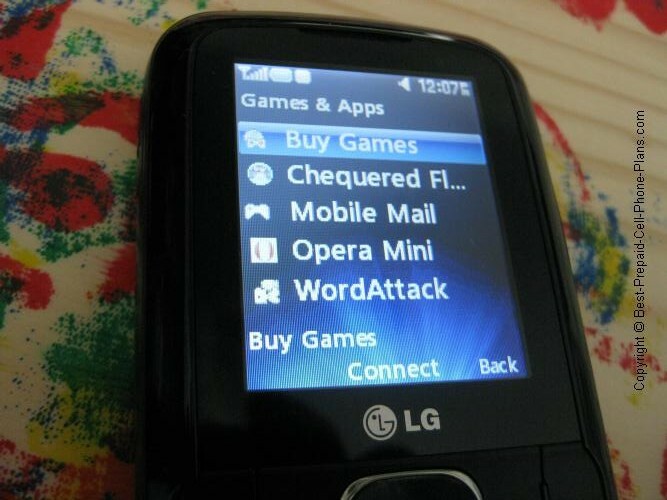 The LG 840g pictured above was the first touchscreen Tracfone with Wi-Fi access which gave you the opportunity to limit your airtime usage while still accessing the mobile web. The LG 505C has a touchscreen and a QWERTY keyboard. The LG 800g, the first touchscreen Tracfone, is also capable of running Java applications. Other goodies include a 2 megapixel camera and mp3 music player. 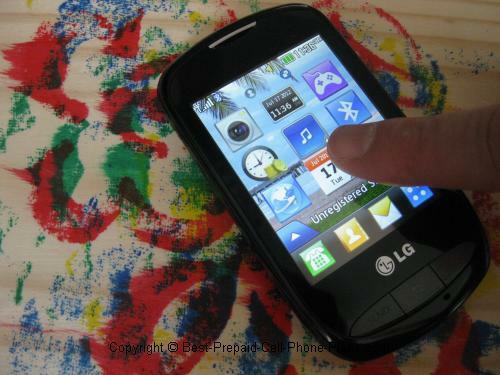 The LG 530g is a slightly improved version of the 500g adding a bigger screen and nicer keyboard. 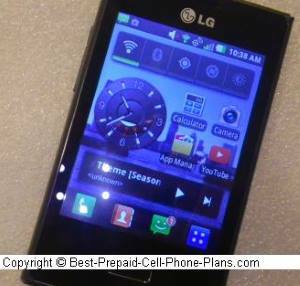 The LG 500g has a QWERTY keyboard (a first for Tracfone), a 1.3 megapixel camera and is also capable of running Java apps. At first glance there don't appear to be any significant difference in features between this model and the 440g. However a reader has pointed quite a few features and apparently one big disadvantage of the 441G. 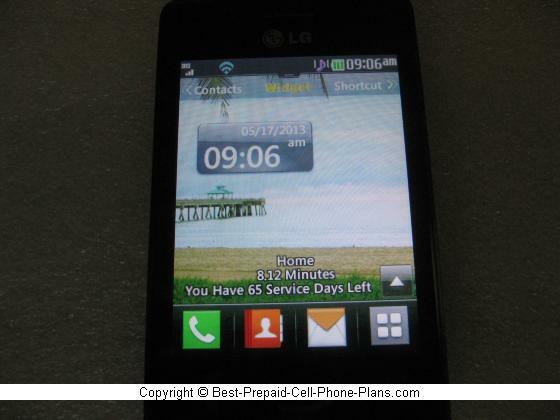 This LG 440g flip phone is available for 19.99 with free shipping. New feature include 3G mobile web and text to speech. Review. The LG 237C is basically a CDMA version of the LG 441g. This version (unlike, for example, the 221C) also has a l.3 megapixel camera. Another plus is that it runs on the Verizon network which may provide better coverage in some areas. These phones are available from big box stores and their online counterparts. Walmart, Target, and Amazon have all carry these phones at one time or another depending on stock. 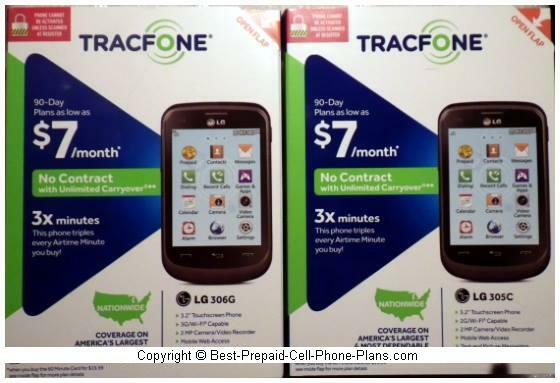 You can also get an LG Tracfone direct with free shipping on orders $19.99 and up. This LG 600g Tracfone features a VGA resolution camera, Bluetooth headset compatibility and a voice recorder. Review. This LG 430g flip phone adds a 1.3 megapixel camera to the capabilities of the 420g, and it is available at a lower price ($14.99). See review here. The LG 420g added a camera and Bluetooth capability to the LG 410g described below. A 1000-entry phonebook also ensures there's plenty of space to store you friends' numbers whether you call them or not. The phone weighs only 2.87 ounces, which is pretty light for a flip phone. Read my review of this phone here. The LG410G is a basic flip phone good for calling and sending text messages. It has one extra feature, a voice recorder, which can come in quite handy. At $19.99, it was not a bad deal (though not a double minutes phone). Read my review here. This LG 225 camera phone has a VGA-resolution camera just like that of the Motorola C261 Tracfone. This is a smaller phone though it does have a protruding antenna. It doesn't have a calendar, but it does has a calculator and a couple of games. Review. Very small and basic. The first Tracfone I found with a Hearing Air Compatibility rating of M4 - the highest possible. It has no camera, but no protruding antenna either. Looks quite nice. LG 200C review. This basic CDMA flip phone does have the protruding antenna. If you still want a Tracfone but not a big fan of LG phones, then here are some alternatives. There are a few good Samsung handsets available from Tracfone as well. The simpler ones at least have good reception and a couple of them even have some pretty good features such as WiFi access. Tracfone only carries a couple of Motorola handsets these days, but they're pretty good.